The housing buildings at the Santa Rita Jail were restored with an elastomeric coating applied to the original fiberglass Built Up roof system extending the roofs useful life a minimum of ten years. All projections and perimeter flashings were restored prior to the application of the coating. Ponded areas were built up to reduce the excess ponding. 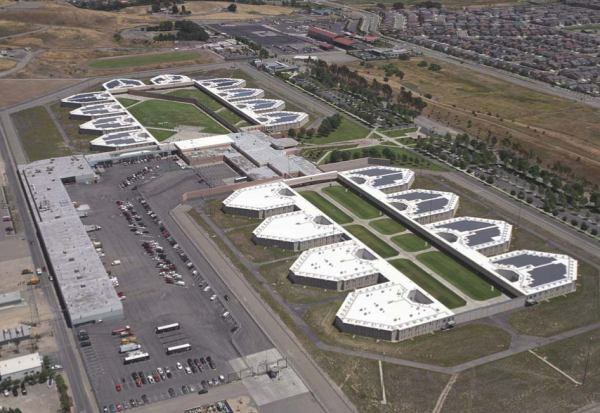 The Jail uses more energy than any property in Alameda County. The county contracted to have the Photo Voltaic solar electric panels installed to reduce consumption during the peak hours. Our crews completed the coating and panel installation over two years as budgets were approved. At the time of installation, this project was the largest solar powered electrical system in North America. The energy savings will pay for this system in approximately 11 years.